Submitted by Fred on Tue, 11/27/2012 - 2:28pm. 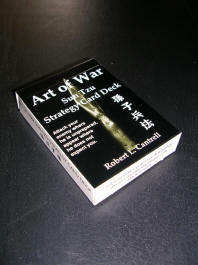 The jack of spades is the first card I pulled from The Art of War Sun Tzu Strategy Deck Titled, “Catch Your Adversary Sleeping.” The strategy behind this card is surprise your adversary where he is unprepared or you are unexpected. The basis is surprise brings your adversary into the engagement on YOUR terms. In law enforcement terms, what comes to mind immediately is our propensity to rush to scenes, blue lights and siren right up out front and running to the front door, announcing our presence to everyone including the potential adversary. At this point who has the advantage is a question we must act? Who has the element of surprise? Is it you standing there on ground of the adversary who knows you are there and knows much better than you the layout of the environment or is it your adversary, who now has the upper hand? Does this direct approach aid us in our efforts or is it possible that an indirect approach such as killing the lights and sirens and parking down the street at a position of advantage lead to those responding getting a better analysis of the situation? Could this advantage lead to, potentially surprising an adversary and catching him off guard and unprepared? Even if the adversary knows we are coming but does not yet observe or hear us his mental state will be very likely confused as he attempts to think about when or if we are coming and hence he adapts his actions. This confusion slows down his decision-making process as he attempts to figure out where we are and or how we will approach and what it is he must do to combat our approach or if all goes well comply with our terms. Getting an adversary to comply is not an easy task but often times we fail to use surprise as a tactical option and we create our own jeopardy at a scene. Replace the “false sense of urgency” that we have a habit of doing to that of a "true sense of urgency" slow things down a bit and set up the adversary so he sees no alternative but to voluntarily comply. If he decides to fight then our tactical response and approach utilizing surprise gives us at a minimum the time to ready ourselves. There is no single solution to a tactical problem and it takes continuously exploring the situation and thinking on our feet in any engagement to win at low-cost. This example of “Catch Your Adversary Sleeping” is only one of many scenarios where surprise can be used to your advantage. How could use the advantage of surprise in helping you win on your terms in a safe and effective way?